This book moved me to tears and if you are looking for a way to start talking to your kids about refugees and how lucky they are to be growing up in a safe, peaceful country this is it. Azzi in Between is about a young girl called Azzi. Her life is happy but she lives in a country that is at war and every day that war is getting closer and closer to her home. One night Azzi and her parents receive news that they are in terrible danger and must flee their home immediately. Azzi’s Grandma has to stay behind. Azzi and her parents eventually find their way on to a boat and come to a new country. They are safe but everything is confusing. They are lonely, poor and so worried about Grandma. Gradually they learn to live in the new country and make their lives there. 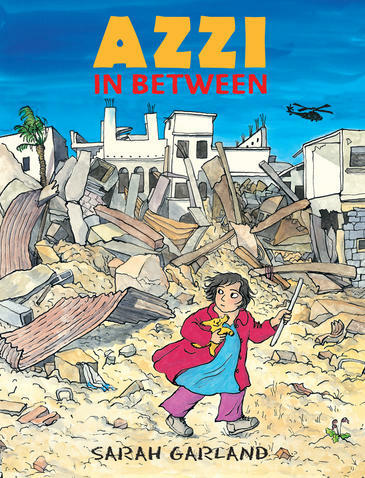 Although it is the shape of a picture book Azzi In Between in actually more a coloured graphic novel in style and is definitely not for preschoolers. It is more for seven to 12 years olds. 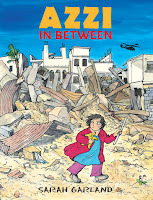 It’s a great story, Azzi is so brave and hopeful, and Sarah Garland's pictures do a brilliant job of conveying the terror of Azzi’s situation, the family’s despair as they try to understand their new life and the gradual dawning of hope in their new country. Perhaps there is no single right way of dealing with refugees coming to Australia but reading Azzi In Between does a lot to persuade you that, whatever they are running from, they certainly need our compassion. The book is endorsed by Amnesty International. Who’ll love it: Kids aged seven to 12 who want to learn about the world or who just love a really good adventure story. The older they are the more they’ll understand the bigger picture behind the story.